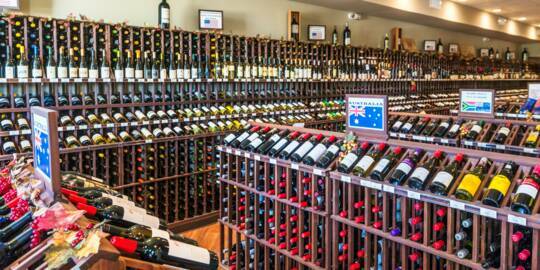 The Ports of Call shopping plaza, Grace Bay, Providenciales. Providenciales is home to most of the luxury resorts and hotels in the Turks and Caicos, and likewise offers the best shopping opportunities of any island in the country. 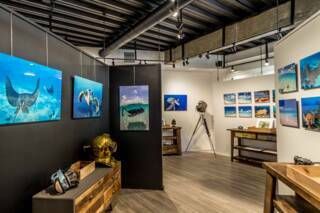 There’s an excellent and interesting selection of gift shops, art galleries, and luxury goods stores to browse, many of which are centred around a few shopping plazas and courtyards in the Grace Bay area. See Customs Allowances for information on duty free items, and what returning guests may bring back to their home countries without incurring customs duty. The retail and dining district of Grace Bay is largely found along a short distance of Grace Bay Road. Two adjacent plazas, the Regent Village and the Saltmills Plaza, are the centre of most activity. The enclave of Turtle Cove located in central Providenciales is another vacation enclave and also supports a few restaurants and shops. 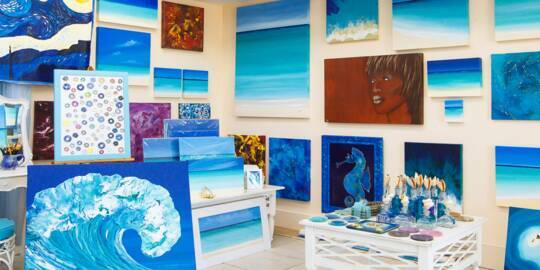 Paintings at Anna's Art Gallery at the Saltmills, Providenciales. 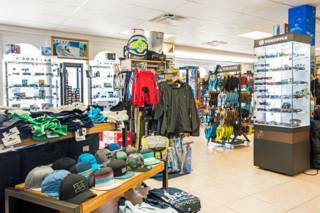 As is the case at most tourist destinations, many of the souvenirs and gifts in shops are imported items with Turks and Caicos rebranding, yet the selection of authentic and high quality goods is better than what’s typically found at other Caribbean islands. 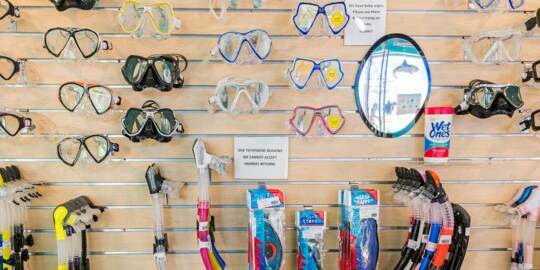 Turks and Caicos shopping can be an adventure and you’ll never know what you may find. 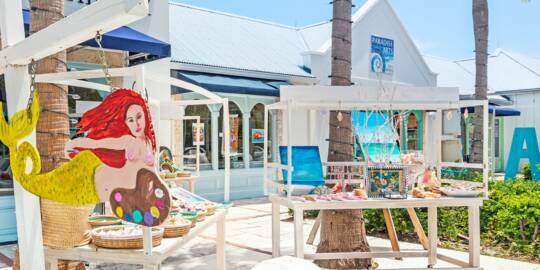 In recent years there’s been a great increase in boutique Turks and Caicos arts and crafts, designer fashion, handmade jewellery, and accessories. These locally-manufactured items have a much better connection to the islands. 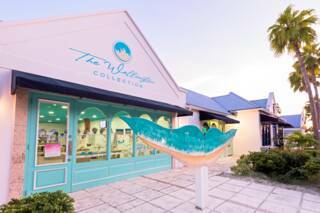 A good example is the jewellery made here, which incorporates Turks and Caicos sea glass, beach sand, and conch, or is cast in silver from molds made from endemic seashells. Painted-metal Haitian lizard sculptures, offered for sale throughout Providenciales. As the art galleries can attest to, there’s a wide selection of paintings, prints, sculptures and crafts. The art scene in the country has been expanding and there’s now a wide range of artists here working in many types of media. 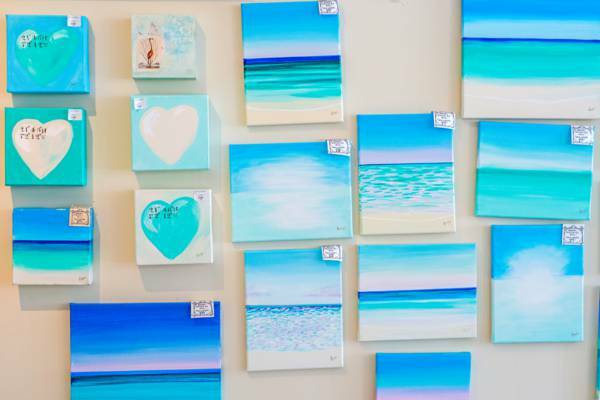 You’ll definitely spot something that will catch your fancy if you wander through one of the Grace Bay galleries. Products from the Middle Caicos Co-op are also making their appearance on Providenciales. These handmade goods from the quiet islands of North Caicos and Middle Caicos are crafted in the same fashion and with the same materials as they used to be more than a century ago. There are woven baskets and hats, old-fashioned dolls, and model sailboats – necessities and toys from a time past. 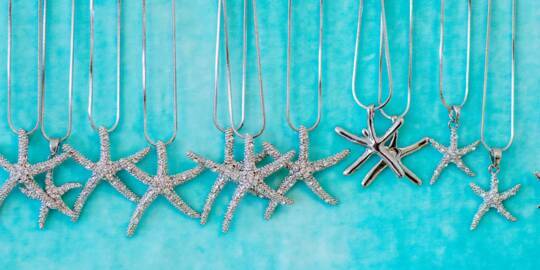 Some pieces in shops here are handmade in the Caribbean, but do not originate in the Turks and Caicos. 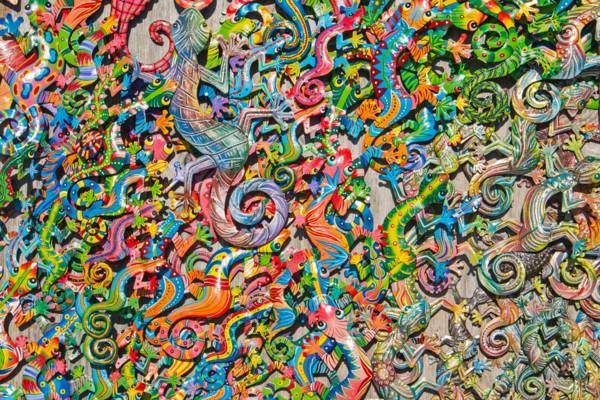 This would include the brightly painted Haitian sheet metal art and some paintings. 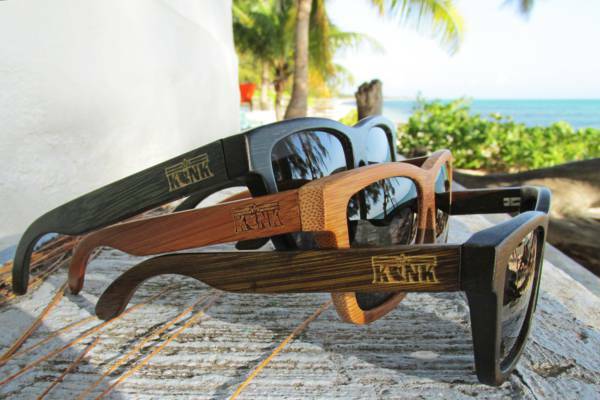 Locally designed sunglasses produced by Turks and Caicos fashion brand Konk Apparel. 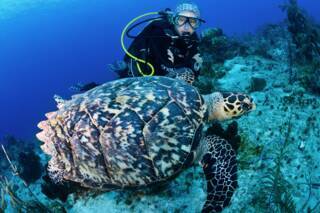 Available at the Blue Surf Shop in Grace Bay. Konk Apparel is an up and coming Turks and Caicos brand, with sunglass, hat and clothing designs. Although not manufactured in the country, unique Turks and Caicos design T-shirts are now available at many shops. Two more options are Sea Sage’s unique silk scarves and Atelys Adrian’s handcrafted silver jewellery with beautiful stone, sea glass and pearl settings. The perfect way to start the day, TCI Coffee Roasters’ gourmet coffee is offered in a wide array of blends. 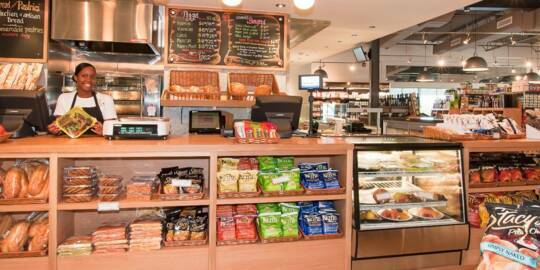 The raw coffee beans are roasted and packaged (both ground and whole) in central Providenciales. 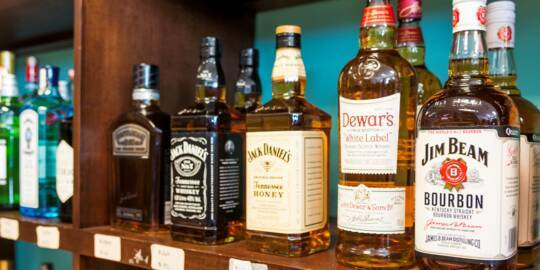 Turk's Head Beer and Bambarra Rum are the two local alcohols. Both are bottled on Providenciales; the beer is brewed from scratch and the rum is blended from regional stocks. Other local items include Peppa Joy hot sauce (made from local North Caicos peppers), South Caicos sea salt, and Lucayan Skincare products. 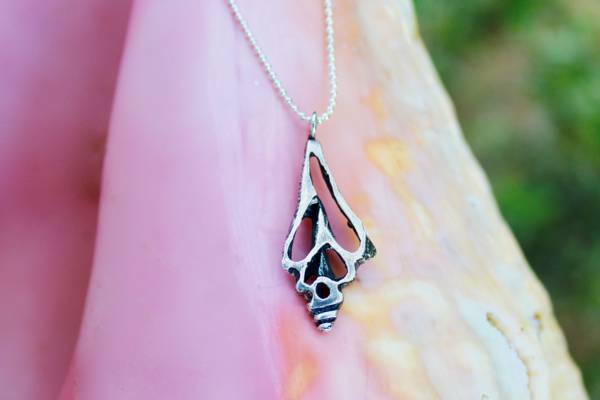 Handmade silver conch necklace by Atelys, Turks and Caicos. Along with contributing to many of the nation’s favourite dishes, the conch also factors into many of the locally-made gifts. The shells, treated as refuse in previous times, are now being turned into vases, dishes and artwork. Although a bit clunky, these pieces are definitely unique! Albeit quite rare, the pastel-hued conch pearl is sometimes found, and is either sold singularly or incorporated into jewellery. 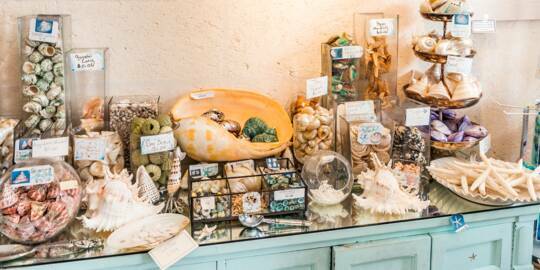 Many of the smaller craft markets and shops offer a selection of seashells for sale, but other than conchs, queen helmets and tritons trumpets, nearly all of these shells are imported. In some cases, there can be non-conch local shells, but these should be avoided due to questionable gathering practices and legality. Conchs are the only legally exportable shell, and certain conditions apply.